This infinite tool cupboards exploit video was created by Snowballfred from The Rusty Cartographers. 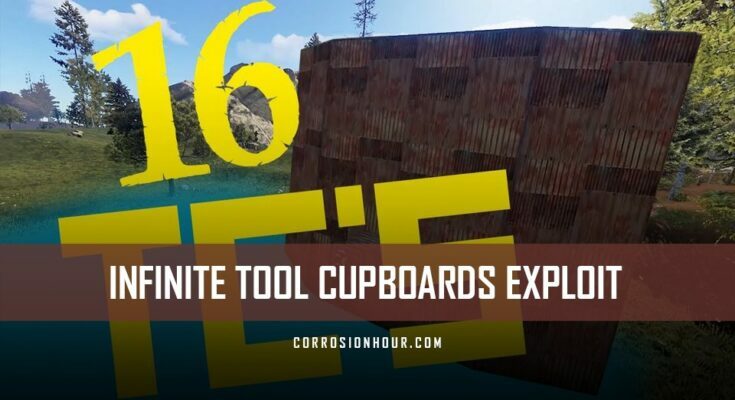 In this video, he walks through a technique that will allow you to place an infinite amount of tool cupboards in your next RUST base design. The technique is pretty simple to execute, but on a Vanilla server you’ll likely need to build a little bit of terracing to properly place the tool cupboards appropriately. Interestingly, you won’t need to put locks on all of the tool cupboards, but doing so will make it more confusing for raiders as they begin to blow into your base. Combine this technique with another Tool Cupboard Exploit and you’ll really do a number on those who choose to raid you. Be sure to browse Snowballfred’s other videos and don’t forget to subscribe to his channel for alerts on his latest work! And now for the trick. I’m not going to build the whole damn base, because ya’ll know how to build a base. But this is the trick. You drop your foundation. Put a couple walls down. Just to keep the place, you won’t actually leave them there before you do the actual TC placement. Come around, and get your TCs. You’ll have to build framework up when doing it on vanilla. Now go around and repeat that process for every single one you want. And then when you’re finally finished you can pop your final TC and that’ll mark building completion. I’ll finish this off just to show you how to wall everything off, not that I need to show you how to do that. It’s pretty simple, that’s the trick. Nothing to it. Enjoy.